This looks like a great asset to planners and others. The following is from the press release. The Office of Ground Water is pleased to announce publication of U.S. Geological Survey Circular 1308 – “Water Budgets: Foundations for Effective Water-Resources and Environmental Management” by Richard W. Healy, Thomas C. Winter, James W. LaBaugh, and O. Lehn Franke. The Circular is available online here. Through this Circular, the USGS seeks to broaden awareness and understanding of water budgets and the hydrologic cycle so as to promote wise use and management of water. The Circular illustrates the importance of water budgets using examples representing a variety of geographic areas and water-resources issues. Uncertainties that exist in water budgets are presented to provide the public and decisionmakers with an appreciation of the relative importance of those uncertainties in evaluating how much water may be available for human and environmental needs. Michael L. Connor, Counsel for the Senate Energy and Natural Resources Committee, which Sen Jeff Bingaman (D-NM) chairs, sent this updated draft of the SECURE Water Act. He indicated that there were a few substantative changes but that most are stylistic/editorial changes made by Senate Legislative Counsel. Sen. Bingaman is still looking for co-sponsors but hopes to introduce this bill within a week or so. The New York Times published the following op-ed piece, Let the East Bloom Again, in its 22 September 2007 issue. Richard T. McNider and John R. Christy, Professors of Atmospheric Science at the University of Alabama-Huntsville (UAH), co-authored the article. McNider and Christy present an interesting thesis: the USA has two major security challenges this century - energy and water. The bulk of our agricultural production occurs in the West, where irrigation is used. The East used to be a big agricultural producer. In 1940, Maine was the leader in potatoes, closely followed by New York. As a youngster growing up on Long Island, NY, I remember potato farms, but those have long since yielded to subdivisions, malls, and vineyards. Idaho and Washington now lead, and irrigation produces more uniform potatoes (ask McDonald's about that). Cotton production, once the hallmark of the Deep South, is now centered in Arizona, Texas, and California. By 1980, the East's agricultural system had gone downhill while the West bloomed. But that price has been steep in terms of environmental flows, water quality, and sustainability. And what about using more Western land for biofuels. Where will the water come from? McNider and Christy suggest revitalizing irrigated agriculture in the East, being careful to use small storage reservoirs on individual farms that would capture irrigation water in the winter so as to not impair summer streamflows. But they caution that Federal government support would be essential to build these off-stream storage reservoirs. Interesting idea - certainly worth considering. But there may be issues with water contamination from irrigation, which they mention, but downplay. The NBC Nightly News is spotlighting water this week - the series is entitled "Thirsty Planet". On Monday, India was featured; on Tuesday, water in the Western USA. Here are some nifty water footprint calculators (national and individual) from the WWW site. My colleague Todd Jarvis, who did the excellent presentation on Bottled Water and the Environment, which I posted on 17 May 2007 (click here), has outdone himself. 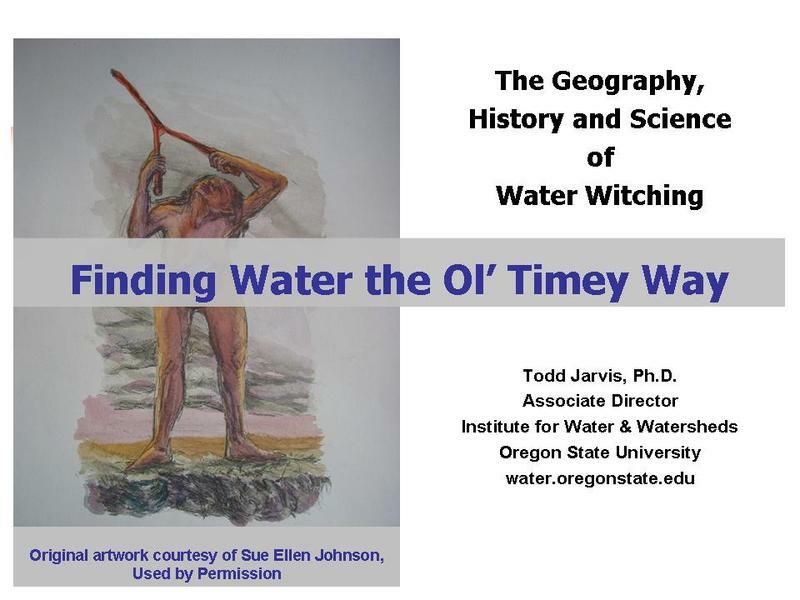 He's developed an even-handed presentation on "dowsing" or "water witching", Finding Water the Ol' Timey Way. Again - the dual-category classification simply indicates the some people consider dowsing bulls**t and some consider it amazing. You decide for yourself.